As a result, I regularly take 15 minutes in these sessions to create a saved report that they can use in the future. Time and time again, these people are blown away by the information available to them. But most advertisers don’t realize this information even exists. 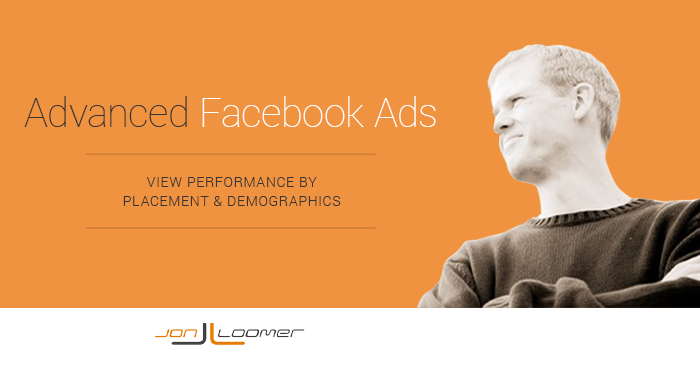 When used, you can optimize your ads for age, gender, country and placement. In other words: Get better results and stop wasting your money on placements and demographics that aren’t working. 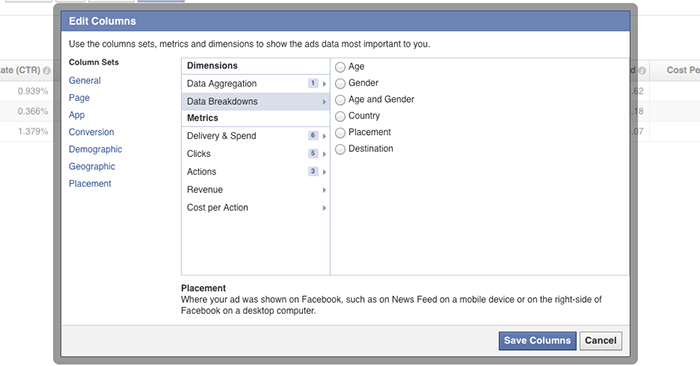 Here is how to monitor performance of your Facebook ads by AGE, GENDER, COUNTRY and PLACEMENT. If you monitor the performance of your ads diligently, you can limit waste and focus budget on what is most effective. Your results will differ depending on the audience and placement of your ads. This is done through split testing. In the past, the only way to accomplish this was through creating many different ads for age groups, gender, country and placement. But that’s no longer required. 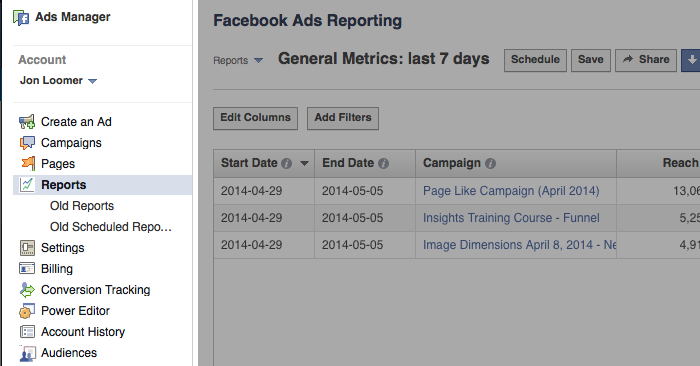 The magic is found within Facebook’s ad reports. The old version of these reports was more or less worthless. As a result, advertisers ignore them. But an update last year makes them one of the most powerful tools in an advertiser’s tool box. It’s not that this information is all worthless. It has value. But it’s information overload. I prefer a report with a minimal number of columns focusing on your desired action. 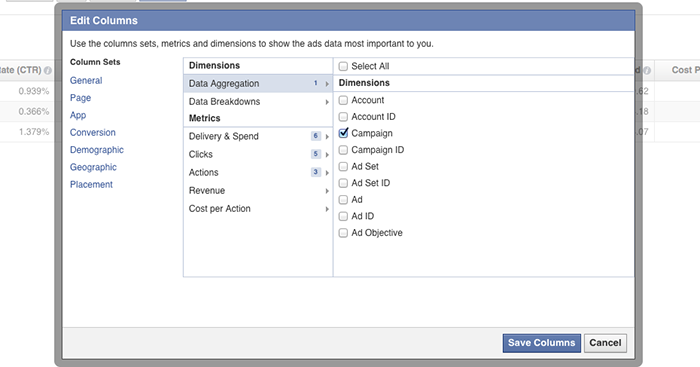 That’s 10 fewer columns, and it focuses on the metrics that truly matter to the objective of your campaign (Page Likes). 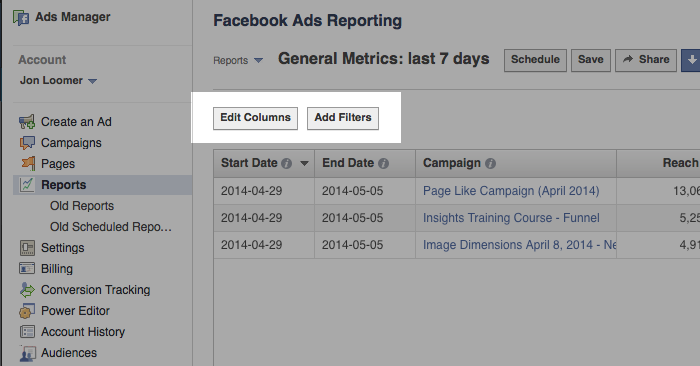 You can take control of your ad reports with the help of a simple button: Edit Columns. By my count, there are 148 different columns you could choose for your report. That’s a lot! Of course, you don’t want all of them. You shouldn’t even want 17 of them. But the right data should be available to you depending on the type of report you want to run. You just need to find it! The true goldmine — and the motivation behind this blog post — is found in the Data Breakdowns section. By default, Facebook doesn’t select any of this data. That’s why most advertisers don’t know it exists! As you can see in the example above, I was focusing on the ages of 25-44 and getting the most success from the 35-44 age group. I was seeing the best results from women, though it’s not a significant difference. In the example above, the unknown and male groups tended to be most expensive, while I was getting the best results from women aged 35-44. Facebook will create a column for countries, generating a row for each country served an impression. In my example above, it’s most expensive to get Page Likes in Canada and US and cheapest in the Netherlands and Ireland. As you can see in my results above, I’m getting the best Cost Per Page Like in this report on mobile devices. This has not always been the case. It’s why you constantly monitor your results! Finally, you can add columns for destination. Facebook will highlight where someone went as a result of your ad. This could be your page, a custom tab or a link. Once you’ve created this awesomely helpful report, it’s important that you save it for later. Otherwise, Facebook won’t keep it for you, and you’ll need to start over every time! Name it something you’re remember later. 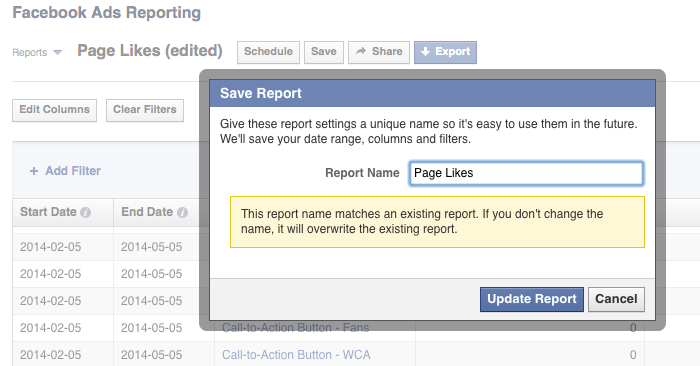 Every time you come back to your ad reports, Facebook will show you that same, lame, default report. But your saved reports will be available within the Reports drop-down at the top. 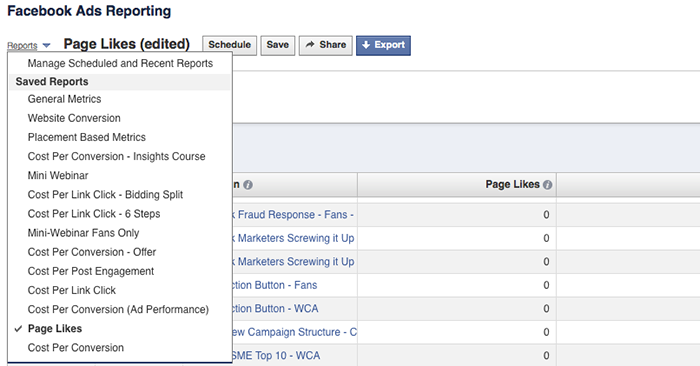 The Edit Columns button within your Facebook ad reports will save you a whole lot of time and money if used appropriately. Are you using these reports? How are you using them? Let me know in the comments below!